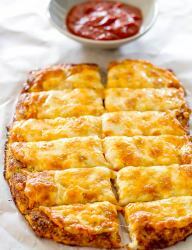 Back in the day, when we were still buying pizza from various places around home, I used to order these cheese bread-sticks made from the same pizza crust and loaded with cheese. We really liked them but if you want to make them yourself, it is a very simple thing, just use my pizza recipe, load it up with insane amounts of cheese and enjoy. However, this recipe is not that, wife came with the great idea of replacing the normal pizza crust with something made from cauliflower which I personally don’t care much about but I am always open to new things so we made it. Thing came out AMAZING but then again, in our kitchen, everything does. No seriously, taste wise, it is way out there and it is also very easy to make. This thing was so easy to make, it’s not even worth writing about. Throw the cauliflower in a food processor for a couple of swirls and then microwave it on high for 10 minutes. Then add eggs, spices and cheese (see recipe) and shape it into a crust; bake for 25 minutes then add the rest of the cheese (I used TexMex) and put it back in the oven for another 5 minutes or until the cheese has melted. All that’s left is to enjoy it, is that fast and simple. Have fun! 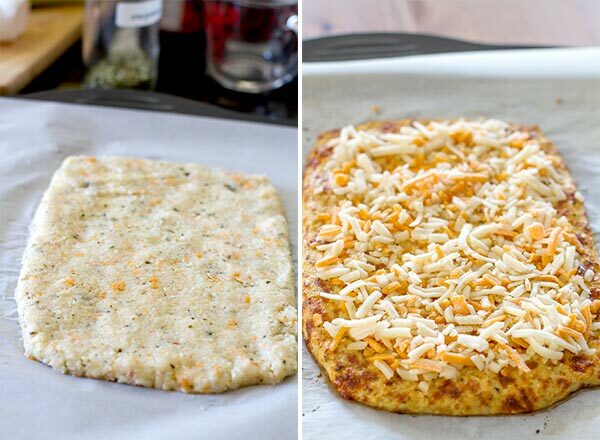 Preheat oven to 425° F / 220° C. Prepare 2 pizza dishes or a large baking sheet with parchment paper. Holy CRAP I’m trying this ASAP…LIKE TOMORROW! THANK U! How can I do it without a microwave so it comes out right please? Difficult to say, you will have to experiment yourself. Try in the oven on it’s lowest setting for five minutes at a time. Cauliflower does not need to be fully cooked, you only need to remove as much of the water as you can. Again, you are on your own. Sorry! I used the frozen riced cauliflower and it came out awesome! Yeh I don’t like to microwave so will try alternatives at it looks great! Steam the cauliflower as an alternative and using a cheesecloth or kitchen linen will help with the removal of excess water; resulting in a crunchier bread stick vs. soggy. Yup…mine turn out soggy cause the recipe didn’t mention straining them. Despite my reluctance I didn’t strain it and followed the recipe. 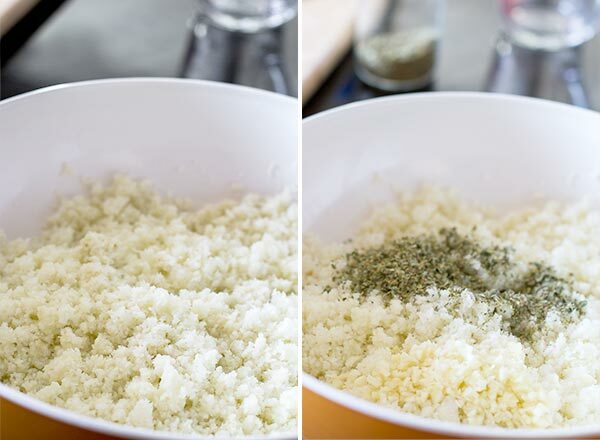 It’ll be best to strain the cauliflower first with a cheese cloth before adding the ingredients . I microwaved mine. Didn’t need to strain anything. I tried it today and loved it! I made my own Marinara sauce and the combination was excellent. My only adjustment next time will be to use large eggs instead of X-large which was all I had…or use 3 X-large. Great recipe for a healthy diet! I do not use a microwave, what would you recommend doing instead? You could always use your oven. What should do if i don’t have a microwave. After you pulse it in the food processor is there anyway I could use the stove top? You should use the oven. The microwave is just to pre-cook it a little bit but you can use the oven, though it might take a while, not exactly sure how much it will take. We steam ours on the stove top in a stove top steamer saucepan. Works really well. A mesh sieve ( metal not plastic or you may as well use the microwave! ) over a pan of boiling water also works if you don’t have a steamer pan. Try steaming it over water for about 7-8 minutes. Should do the same thing , just don’t add the water to it. Loved this recipie! I only used 3 eggs though. It made the mixture a little less runny. I didn’t have parchment paper so I just used foil. I read on other recipies to flip the crust over so I did do that by putting foil down on a similar sized baking sheet and putting them together and flipping them over. . It made the crust brown on each sides making it a little crispier. Turned out delicious! Hello! I was wondering if “riced cauliflower” considered as a carb? Cauliflower is a vegetable, so no. do you know how many calories this recipe is? What is the purpose of putting the cauliflower into the microwave? To cook it or to dry it? Do you think frozen cauliflower would work just as well? Frozen cauliflower could work but you’ll have to squeeze the water out of it. I made this with 2% cheese (3 cups total) and actually skipped the microwave part (by accident) and it turned out perfectly! 1/8 of the recipe was 168 calories! Delicious!!! I did dry it with a paper towel a bit after I spread it on the pan. This recipe is amazing! I made it two days ago and it turned out great! I did take the suggestion of another reader and only added 3 eggs and turned it on both side for a crispier crust and OMG – Yum! Even my totally picky 15 year old son ate it and liked it. thanks so much for posting – this is a keeper! I tried making this with 3 egg whites and 1 egg with the egg yolk and everything as mentioned in the recipe, but resulted in soggy moist dough after baking. Could the egg whites be the reason why? Nope! I used whole eggs and if it seems to water, microwave it a bit more or use some paper towels to get rid of the extra moisture. Love this recipe. Definitely I wanna try. Can you tell me what can be added to replace the eggs? I already answered to that. See above! Hey… great recipe…. is there any alternative for eggs? hmmm… the alternative for eggs… not for this recipe since egg is what binds the cauliflower together. There are a bunch of egg replacement products but you are on your own there. I followed this recipe to a T, and the bottom came out soggy, and it had a very strange consistency almost like curdled eggs, do you know what went wrong?! Maybe you need to microwave it a bit more, not all microwaves have the same power, that’s the only difference I can think of. The mixture has to be sticky and pretty dry before you bake it. Omg this was amazing!!!! Hello new appy! My boyfriend didn’t even realize it was cauliflower! Thank you for the recipe! This is one of my favorite dough recipes so far!!! No idea, give it a shot and share your results with us. Followed recipe and ended up with a thin slightly rubbery cheese omelette ! I thought this would be crispy ! Where did I go wrong ? Not enough time in the microwave I would guess or maybe you washed the cauliflower and it was full of water… I’m guessing here. The microwave power setting might be an issue too, mine is locked on high. Are the eggs merely a binder here or do the eggs scramble up and leave the texture of eggs? Thought this would be yucky, like the time I did spaghetti squash not knowing how sweet it was. But, no this was great! Tasted like cheesy bread at its best. I’m now more open to trying other cauliflower dishes. Being on low carb it’s hard to find those foods that we crave like bread or Pizza. PS if I wasn’t eating low carb I would still make this!. Fab-u-lous from South Africa. Cauli is not considered very low carb, ideal if you are Banting. Sorry I meant to say cauliflower is very low carb .. not the opposite. We tried and it was tasty. Loved it! Skipped the microwave part but it came out perfect! This was surprisingly good. I actually made it in a cast iron pan lined with parchment paper on a gas grill at the prescribed heat and time. I also used the Trader Joe’s organic frozen cauliflower too and just reduced the entire recipe by 3/4 to adjust to the amount. It fit my Lodge cast iron perfectly with the single mixture. I want to try this but I am missing something. Am I to put water in the cauliflower in microwave to cook it or just put raw dry riced cauliflower in microwave? I am reading you need to get the water out, but don’t see where water is put in. There is no water, I know it might be a little confusing. I should have probably said that you need to microwave it in order to remove some of its moisture. Excited to try this! Wondering if anyone has tried making it without the oregano or maybe substituting another herb like basil. I’m an anti oregano girl and am trying to decide if best to eliminate or sub? Do you know what the calories are per serving ? Carbs ? Protein ? fat? 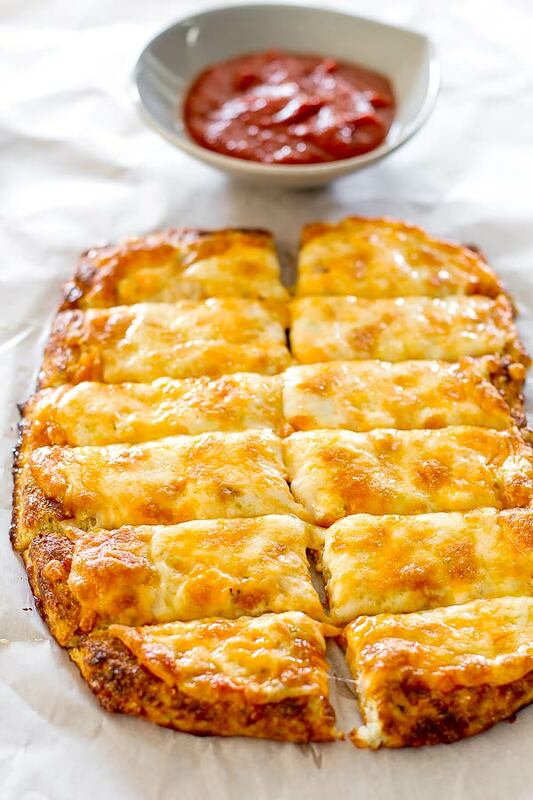 Made this today and it was a hit both as cheesesticks and pizza crust!! One question: instead of microwaving to get the moisture out, could you mix some salt in, let it sit, and then squeeze the water out? Or would you not get the same effect? This is Delish! I got a head start by buying riced cauliflower from the grocery store. I used a mixture of mozzarella and three cheddar blend the first time. The second time I used only the triple cheddar cheese…that’s all I had. I also halved the recipe and used my toaster oven. My husband loved it and he’s not big on cauliflower. He’d also be the first to say IF he didn’t care for it. I did turn it over half way through. The second time around i spread the mixture thinner which turned out crispier. made this last night and it was delicious and easy easy !! will make again soon ! !